January 1916: Bert Brocklesby is a young schoolteacher, and preacher at his local Methodist church; Bertrand Russell is one of the greatest mathematicians of his time. With the advent of military conscription their worlds are about to be turned upside down. 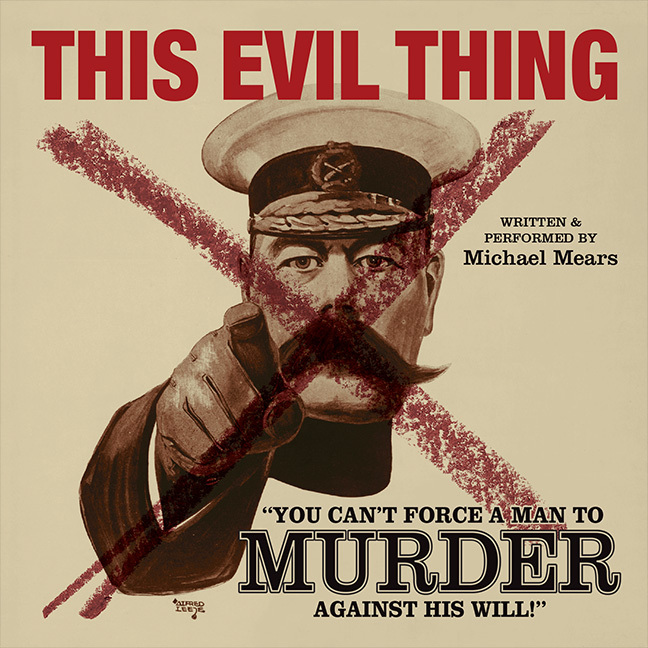 THIS EVIL THING is the compelling, shocking and inspiring story of the men who said no to war; a rarely told story involving a dizzying journey from a chapel in Yorkshire to the House of Commons; from an English country garden to a quarry in Aberdeen; from a cell in Richmond Castle to a firing squad in France. With military conscription still in force in many countries today, and prisoners of conscience still languishing in jails, the questions posed by THIS EVIL THING are as relevant and urgent as they were one hundred years ago. Michael Mears – ‘The Fringe-First Award winning master of the one-man show’ The List (on Soup) –portrays a gallery of characters from conscientious objectors to army generals, from Prime Ministers to world-famous mathematicians, with breath-taking physical and vocal dexterity. This highly original piece of storytelling uses verbatim testimonies, a multi-layered sound landscape and vivid visual imagery.